A little over a year after the death of a horse named Jerry, who collapsed while pulling a carriage through the streets of downtown Salt Lake City, Utah on a hot August afternoon, the company which owned him has announced that it will be shutting down for good. Carriage For Hire, which offered horse-driven tours around town and for special events, was the last horse-drawn carriage business left in the city. It's closure effectively brings the industry there to an end. A statewide debate about carriage rides was sparked last year when footage appeared online showing 13-year-old Jerry sprawled on the roadside, too exhausted to stand. Although Carriage For Hire initially denied claims that he was sick, it was later revealed that the horse died not long after. Carriage For Hire contended that their 17 horses were well-cared for and that cholic, a common disease in horses, was to blame for Jerry's death, not exhaustion. But that explanation did little to quell larger criticisms of using horses on the city's streets. 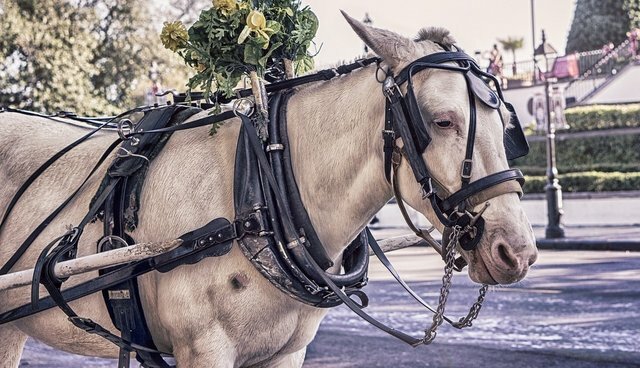 Following Jerry's collapse and death, PETA and the Utah Animal Rights Coalition called upon city leaders to enact a complete ban on horse-drawn carriages in Salt Lake City. The latter group argued that the use of horses in an urban setting was inherently dangerous, saying the animals were "overworked in miserable weather extremes, subjected to the dangers of congested traffic, and forced to walk on hard asphalt for several hours each day." Instead of banning the practice, however, the Salt Lake City council responded to the incident by enacting stricter regulations, like in limiting the amount of time horses are worked and requiring they get regular veterinary attention. Still, the negative exposure regarding carriage rides proved too much to overcome. The Dodo's attempts to reach out to Carriage For Hire by phone were met by a recorded message stating the business has closed its location in downtown Salt Lake City. It's unclear what will happen to company's horses, but a former carriage driver told news station KUTV that the owner "has to get rid" of them. Elsewhere, horse-drawn carriage rides may soon be a thing of the past as well. New York City Mayor Bill de Blasio has called for an end of horse-drawn carriages too, and following a spate of controversial incidents in the city, support for an outright ban is gaining momentum.